admin June 7, 2018 June 7, 2018 No Comments on How To Update Your PC Drivers? If you have your own PC and facing a computer problem then the suggested solution is you need to update your device drivers but you don’t even know how to do it. Here are simple steps and information that will give you an idea what device drivers are and why is there a need to update your computer drivers. Before updating the device drivers, it is necessary to understand what a driver is. A device driver is a file in the computer system that controls and holds all the information of both internal and external devices that are attached to the computer. These include the modem, printer, scanner and disk drives. These are used to help the computer communicate with the different devices attached to it. For few Windows version drivers are built in already and will be automatically installed in the system if the driver is already stored in the Window driver library. Most computers don’t recognize new devices that are attached to the computer so it needs to be installed either from a disk or via the Internet. It is best to use drivers that are provider with the device service providers rather than use the Windows built in drivers because it is better written and quite more up-to-date. It is important to update a device driver if the device is already working strangely or an error already exists in it. First thing to do, when you update driver you need to get it from the device providers via their Web site. Most of devices attached to the computer system offers customer care support on their Web site that also contains driver files and other information. Some also offered CD’s that contains the drivers but it is always better to get it from the manufacturer of the device. Some of the sites that offer you a list of device drivers you can either go for driver update software’s or websites etc. Second step, figure out first the made-in and model of the device before updating it. This can be seen in the manual of the device or in the underside of the device itself. For devices that are attached inside the computer, this can be found in the Control Panel then under the System tab and then the Device Manager. Third step, once you have the device name and the correct driver from the manufacturer’s Web site, it will automatically prompt you to run and download the file and save it in the computer system. Fourth step, after the driver is downloaded and saved into the computer disk, here comes the actual part of updating the driver. Just go to the Control Panel, under the System tab select the Device Manager Tab. Find and select the device you want to update. Click the plus sign next to the categories; click on the Properties and them the Driver Tab. Last step, click on the Update Driver button and choose the Display a list of drivers and choose Have a Disk options. The system will automatically update the appropriate driver. Just wait until the installation process is successfully done and finally reboot your machine so that the new device will take effect. 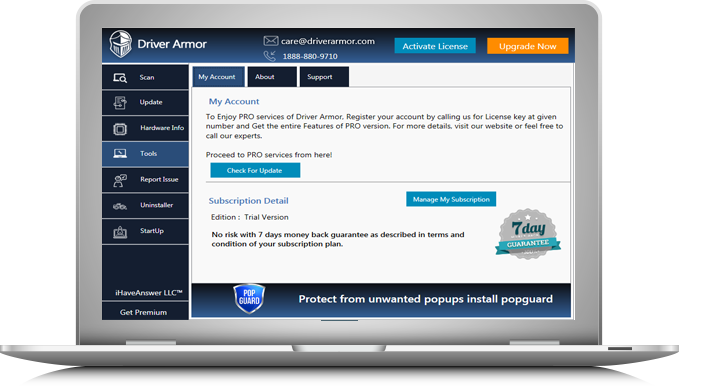 However if you’re looking for quicker solution on your driver’s problem try Driver Armor. It can be readily available in the Internet and comes with different features and specification. Updating drivers is important once in a while because this will protect and improve the device performance and allows a better communication between the computer and the device.